Marvel Superheroes Thor by Toy Biz! With no less than three Thor movies starring Chris Hemsworth appearing at the rate of one of year - last year's Thor, directed by Kenneth Brannagh, and the imaginatively titled sequel Thor 2 still to come in 2013, and of course, Joss Whedon's The Avengers presently smashing box office records all over the world - Thor, the Norse God of Thunder, has never been so popular. 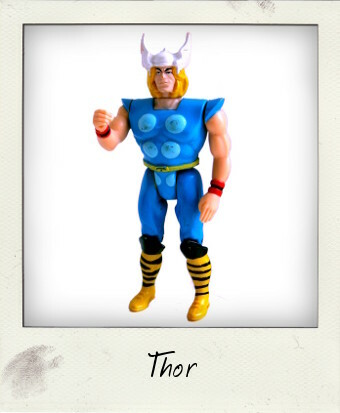 A veteran character from the Silver Age of Comic Books, Thor was created by the comics dream team Stan Lee and Jack Kirby, together with Lee's younger brother Larry Lieber, first appearing in Journey into Mystery #83 in 1962, looking rather like this 1991 action figure by Toy Biz. When in the late 1980s fledgling toy company Toy Biz (now known as Marvel Toys) attempted to enter into the super hero action figure retail war, their DC Comics inspired “Super Heroes” 4 ¾ inch line was seen by many – then and now – as a shoddier-made version of the immensely superior Kenner Super Powers figures from earlier that decade. Regardless of the quality of figures, however, the company thrived having clinched deals for both the DC Comics and Marvel toy licenses, and by the early 1990s Marvel Superheroes hit toy shop shelves. Our vintage Thor here was released as part of a second wave of figures which included Venom, Green Goblin, Iron Man, the Punisher and a couple of Spider-Man figures, and is actually rather good, bar a few errors that typify the hit-or-miss nature of the early Toy Biz releases: mysteriously Thor was issued minus his trademark red cape, and the torso should have been a darker blue. Standing slightly taller than his counterparts at exactly 5 inches tall from the toes of his yellow boots to the tips of his winged helmet, he is a pleasingly chunky figure, who stands well, albeit in somewhat limited poses given the seven points of articulation. This loose figure has lost both his lightning bolt and hammer, but collectors should look out for the version with “long” hammer and lightning accessories, which is slightly harder to find. 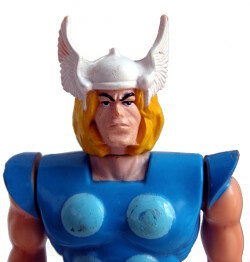 A variation was also released with a lever in his back to operate a “Smashing Hammer Action” in his right arm – Toy Biz never really mastered the hidden power action that made the Kenner figures so special – although my Thor is without a lever and his limbs seem to move normally. Probably the most successful aspect of this figure is, rather surprisingly, the facial sculpt – it may be crude, but there's been a real attempt here to create an individual and expressive face that actually looks like the comic book Thor, making this a must-have for Thor fans! Another point in this Thor’s favor: he is wearing his helmet, unlike some more recent versions I could point my finger at.